The past year was marked by a number of major achievements in relations between the two countries. For 2018, the leaders of both countries have confirmed their intention to take the Russia-China partnership to a higher level. Beijing remains committed to expanding strategic cooperation with Moscow, Chinese Foreign Minister Wang Yi said in a New Year telegram to his Russian counterpart Sergei Lavrov. "In 2018, China is ready to join efforts with Russia to comprehensively develop the consensus reached by the presidents of the two nations as well as to deepen strategic cooperation in the international arena and make attempts to establish a new form of international relations, which would be based on mutual respect, fairness and mutually beneficial partnership," the top Chinese diplomat said. 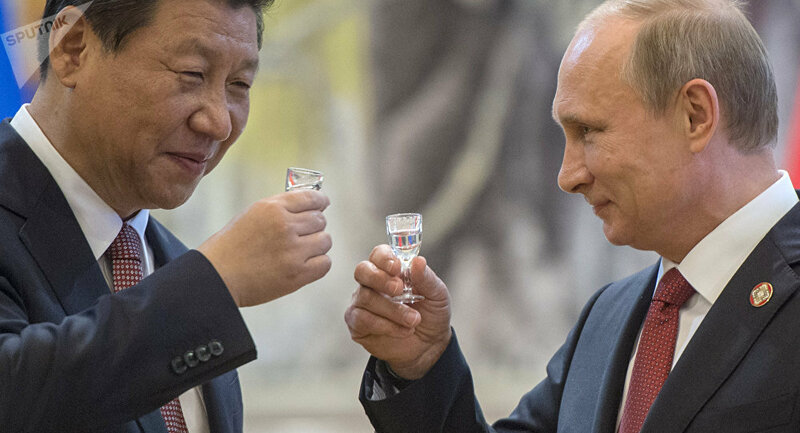 Wang also pointed out that in 2017, Chinese President Xi Jinping and Russian President Vladimir Putin greatly contributed to advancing Beijing-Moscow strategic cooperation and partnership while Russia and China continue to increase mutual trust on the political level. "The level of pragmatic cooperation is improving and the two nations maintain a close partnership on the most significant matters of international concern," the Chinese minister said, adding that China and Russia make major contributions to peace, security and sustainable development on both regional and global levels. Earlier, Xi had said that China would strengthen cooperation with Russia in 2018. "President Xi Jinping said he was ready to join his Russian counterpart in improving political and strategic mutual trust and in developing comprehensive pragmatic cooperation," he was quoted as saying by the Xinhua news agency. The Chinese president underscored that in 2017, Beijing and Moscow had made progress in the development of bilateral ties and partnership. "Both sides maintain close cooperation on the most important international issues and continue their contribution to the protection of global peace and stability," Xi said. He also expressed confidence that China and Russia would intensify regional cooperation in 2018 and 2019. In his greeting message to the Chinese president, Russian President Putin said that new achievements were made in Moscow-Beijing ties in 2017, including an increase in trade and the development of scientific, technical, cultural and humanitarian cooperation. The Russian head of state also said that the two countries continue to contribute to resolve global problems. Putin underscored that Moscow is also ready to enhance strategic cooperation with Beijing in 2018. The prime ministers of the two countries also exchanged New Year’s telegrams. In his message, Chinese PM Li Keqiang said that in November, his meeting with Russian counterpart Dmitry Medvedev resulted in an important consensus on comprehensive cooperation. In turn, Medvedev also underscored the level of bilateral cooperation and pointed to a number of joint projects which are currently being implementation. In early-December, Russian Foreign Minister Sergei Shoigu met with Vice Chairman of the Chinese Central Military Commission Zhang Youxia. During the talks, the Russian minister said that the development of strategic cooperation with China is one of the priority goals of Russia’s foreign policy.